Vietnamese hair, single drawn, cheap quality. 100% real human hair, no henna. This is on-demand type of our customers in Thailand: Much short hair inside, much rubberband, not enough size. Color: dyed black (#1, #1B). 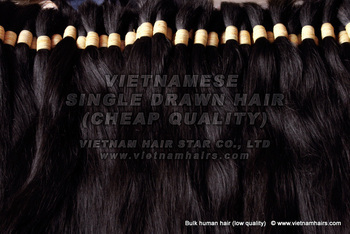 Keywords: human hair, vietnamese hair, vietnam hair, raw hair, bulk hair, cheap hair.